But if he continues to indulge politicians who play to the gallery and want him to do so too, then affection for this government will decrease, and he will be abandoned by those very politicians. In this context I will examine here one of the main mistakes those who advise the President made way back in 2009, a mistake that continues to haunt us. Not many people have seen the report produced recently by a body called white-flags.org, reportedly prepared by Yasmin Sooka who was on the Darusman Panel. It deals with the incident that caused much controversy in December 2009, when Sarath Fonseka said that the Defence Secretary had given orders to kill surrendees carrying White Flags. Minister Mahinda Samarasinghe was asked to conduct a press conference to deal with this allegation, and his Human Rights Consultant had found a previous report in which Fonseka had said the opposite, seeming himself to take credit for dealing with those carrying White Flags when he had been ordered to spare them. But then Mahinda was relegated to a minor role, as he told me dejectedly (I was in Kandy at the time, and had said I could not join him), and the conference was entrusted to Wimal Weerawansa. His claim was not that Fonseka was a liar, but that he was a traitor – which was obviously interpreted to mean that the incident had occurred but Fonseka was wrong to have disclosed it. I realized later how influential elements in government were determined to milk the statement for what it was worth. Fonseka subsequently withdrew the statement, and I reported this to Philip Alston, the UN Rapporteur on Extra-Judicial Killings, who had written to us about Fonseka’s statement. But I was told that this was an error, and the letter of clarification I wrote (which also drew attention to inconsistencies, so as to make clear that the charges he had made were unfounded) was never delivered. Instead Shenuka Seneviratne withdrew my first letter after it was delivered, but as her despairing colleague Aruni Devaraja put it, this was totally unprofessional since obviously Alston’s office had kept a copy of the letter. Our Mission in Geneva had promised an answer but nothing further was sent, and in fact they stopped responding to queries from UN Special Procedures for the next couple of years. The regular interactions we had had, with for instance the Working Group on Disappearances (which had led to positive comments about Sri Lanka in their reports) stopped, and it was only last year that we recommenced positive engagement. Meanwhile Weerawansa went to town and accused me too of being a traitor, a term he flings about freely, and will doubtless use soon on the President as well as the Secretary to the Treasury. I am told that it was his pressurizing that led to someone deemed more popular being appointed Minister of Education, which is why educational reforms too have relied largely on cement instead of developing human resources. His party even had a Press Conference when Mohan Pieris engaged with the Darusman Panel, and claimed that I too had gone to New York with Mohan, which was a particularly absurd idea, given that by then Mohan saw me as a nuisance, and had persuaded the President not to put me on the Committee to implement the Interim Recommendations of the LLRC. I realized later what he meant when, after I had badgered him to have a meeting of that Committee (the President had instead asked me to monitor its work), he confessed that the Committee had never met. The upshot of Weerawansa’s antics is that it seems now definitely established in the eyes of the world that the government was responsible for any extra-judicial killings that took place. And subsequently the very rational approach of the LLRC, that abuses had occurred, and should be investigated, but there was no evidence that these were systemic, has also been ignored. It is as though Weerawansa and those he influences believe that continuing denial will make the problem go away, whereas what has happened is that more and more evidence is emerging that will lead to charges of war crimes on a scale this country does not deserve. 1) We in this 2nd National Convention of the National Freedom Front strongly condemn “the 2014 American Resolution” passed against Sri Lanka’s sovereignty and challenge its legality and morality as it was passed against international standards at the Geneva Human Rights Council. Also we propose in this National Convention that none of the international agents be sent to Sri Lanka to investigate the so called war crimes shall be allowed to enter our motherland. 2) This National Convention also proposes that no investigation or inquiry should be held due to undue international influence other than what has already been initiated in accordance with the Constitution of Sri Lanka and the national legal system. Also we strongly condemn the suggestion made by various political forces influencing the Government to hold such internal investigations. I can understand the resistance to an international investigation, but such resistance is possible only if there is a credible internal investigation. Unfortunately, given the stonewalling of the last few years, credibility will also need some international involvement, at least in an advisory capacity. But with the ostrich approach continuing, the belief that the problem will go away, the chances are that condemnation will be harsher. Indeed I am told that at a family gathering even some of the Rajapaksas have registered that charges will be brought. But there is still no effort to overcome the problem rationally. Seven years ago, when Dayan Jayatilleka was appointed to Geneva, he discussed the need to take action with regard to the five boys who had been killed in Trincomalee. He says the President agreed, and indeed I was present once when the President rang the Attorney General and asked him to issue indictments (this was not done on the grounds that the case would be lost). Dayan says that, at the meeting, there were no objections to the decision, but that as they were leaving the Secretary expressed some sympathy for servicemen who might have over-reacted. I was reminded of this story when I saw in the Sooka report his defence of what might have happened to those who had surrendered – “can you expect a young recruit, barely a month into battle, to recognise a senior LTTE cadre and make a decision as to shoot him selectively or spare him?” Dayan has made the point that a Colonel has to look after his men, and perhaps it is understandable that the Secretary feels protective about those under his command. But it is also necessary, for the reputation of the force as a whole, to enforce discipline and deal with those who violate it. Failure to do so leads to condemnation of the whole. The Secretary however understands the world and would listen to reason. Unfortunately, with advisers such as the Pieris twins and Wimal Weerawansa, he has little chance to think rationally about the problems that now face us. 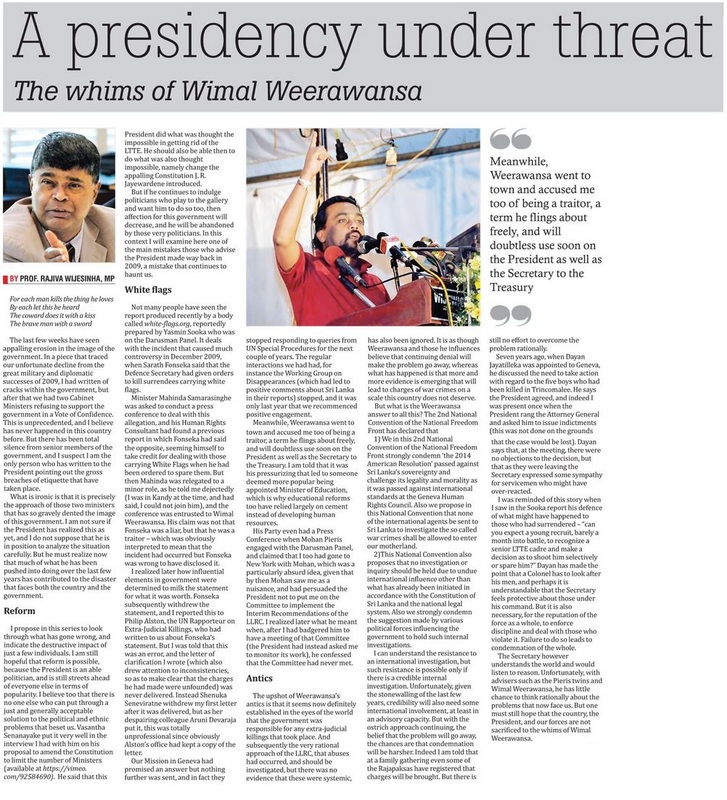 But one must still hope that the country, the President, and our forces are not sacrificed to the whims of Wimal Weerawansa.